We start by digging a hole of 25 inches (63cm) diameter and 25 inches (63cm) depth for every young tree that we intend to plant. We then place the bare root trees carefully inside the holes and we cover with soil. Keep in mind that the point where the scion is attached must be at least 3 inches (7,5 cm) above the ground level. Adding a fertilizer at that time will most probably hurt the young roots of the trees, so it must be avoided. 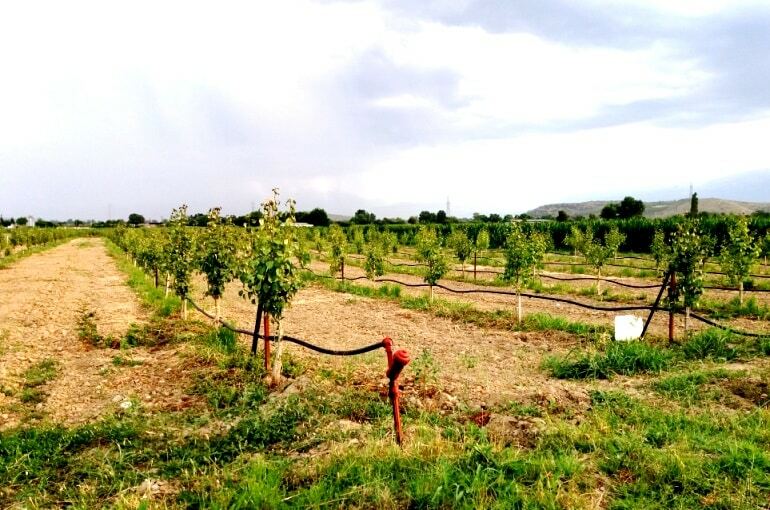 We can irrigate and start pruning the young trees (in order to give them shape) immediately after planting. Many farmers add mulch around the tree trunk, but the mulch should not have direct contact with the tree trunk. They do this in order to increase water holding capacity of the soil and deteriorate the growth of weeds. After planting, we have to place a supporting stake next to every young pear tree, so as to decrease the possibility of wind or other damage. The distance that we leave between the pear trees depends on the cultivar (the final size of the mature tree) and our preference regarding extensive farming. The distances between rows and between trees in the row range from 22 X 16 feet to 6 X 6 feet (7m X 5m to 1,8m X 1,8 m). 22 X 16 feet pattern results in 124 trees per acre, or 306 trees per hectare. 6 X 6 feet pattern results in 1210 trees per acre, or 3000 trees per hectare, and of course can be achieved only by using dwarf varieties. In the previous years, pear trees were spaced at an average of 20 X 20 feet (6 m x 6 m). This pattern gave 109 trees per acre or 270 trees per hectare and took about 15 years to reach maximum production, whereas nowadays -by using dwarf rootstocks- we can have about 810 trees per acre or 2000 trees per hectare and maximum production can be reached within 7-8 years. Keep in mind that 1 hectare = 2,47 acres = 10.000 square meters. You can enrich this article by leaving a comment or photo of your pear farm’s planting distances and plant population.